Days after the Blackberry Playbook tablet's price dropped to $200 and up, something strange is going on: Retailers are removing the Playbook from their online catalogs, and some Best Buy customers say their orders have been canceled. Electronista first noticed some customer complaints on Best Buy's forums. Customers said Best Buy took their orders and charged their credit cards, only to cancel the orders a couple days later. Best Buy representatives apparently told customers that it had "overextended" with its cheap Playbook offer--the tablet's full retail price is $500 and up--but that doesn't explain why the Playbook isn't listed online anymore. Only refurbished Playbooks are listed now, and they're all sold out online. Staples, meanwhile, lists only the 64 GB Playbook for $399.99, and OfficeMax lists the 32 GB model for $299.99. Neither retailer lists the $200 Playbook at the moment. Best Buy and Research in Motion did not immediately responded to requests for comment. My guess is that retailers were only given a certain number of heavily discounted Playbooks to sell, and they sold much faster than expected. 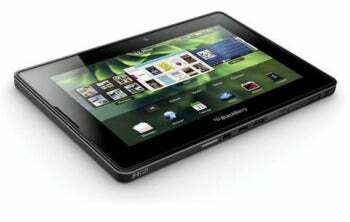 (As we learned from the HP TouchPad, people go crazy for huge discounts on expensive tablets.) Faced with listing the Playbook at a higher price or at a lower price that may never be offered again, retailers may have removed the listings entirely for now. Again, I'm just speculating, but given Research in Motion's statements of being committed to the Playbook, I don't think this a sign of the tablet going away. Fortunately, bargain hunters can still order the $200 Blackberry Playbook from RIM's online shop. And according to SlickDeals, the coupon code "09OLTY12" gives an extra $10 off, plus free shipping. The Playbook received a middling reviews from the tech press, mainly because the software was buggy at launch, and because the tablet doesn't have native apps for e-mail, contacts and calendars. RIM says those apps will arrive with a major software update in February.